explore. — erin westermeyer | writer. photographer. adventurer. Confession: I told myself this post didn’t have to be deep, but dang, that’s just not my style. I’ve struggled with identity for as long as I can remember. Never knowing what group I belonged to. Struggling to choose a college and a major and a career. Identifying with everything and nothing at the same time. I felt if I said yes to one thing, that meant I was saying no to everything else. And I didn’t want to miss out on any opportunity. That’s my struggle. I think it has to be this or that. Never this and that. Last year, I took a much needed break from my 4-year-old photography business and started working nearly full-time at a desk job. In an actual office. Doing work I didn’t have to think too hard about. I didn’t have to figure out who I was. I didn’t have to choose one thing or another. And once the pressure released, the pressure to define myself by my career, I found the freedom to be whatever I wanted to be. My heart was unleashed to wander toward whatever it loved. Before, I always thought I had to choose. Photographer or writer. A job that pays or a life of adventure. A steady career or a lot of travels. But here's the thing. In the past year, I’ve traveled more than I ever have before. I’ve stepped way out of my comfort zone. I’ve created images that are by far my favorite I’ve ever shot. I’ve written through pain and joy and have discovered more about myself through that. I was chatting with a co-worker and sweet friend recently, and I was telling her about another upcoming trip. I explained how much I wanted to go but that it didn’t seem all that logical. And I almost fell over. That’s what my life has been lately. Exploring all the possibilities. Exploring new cities. Exploring the unique ways God has wired me. Exploring all the passions He’s given me. Exploring life beyond the walls I thought I needed to build into my life. That’s what I want this space to be. Exploring the way God works through the messy of life. Exploring the world through adventures and photographs and community. Exploring what it means to live a meaningful life in a chaotic world. And if I were to say one thing to you, I’d echo what my sweet friend said to me. There’s more for you outside of the story you’re telling yourself. There’s more for you outside of the limitations you put on yourself. There’s more outside the labels you wear on your sleeve. There’s more outside the lies you believe and the words you hold onto. I dare you. Explore. The closed doors in your own heart. That thing you’ve put on the back burner. New roads and and new cities and new relationships. Fresh opportunities and dusty dreams. Explore. Everything you always wanted to be. All the things you thought could never be possible. Get out there and explore the unknown. It's gonna be a wild adventure, but it's going to be worth every bruise and every victory cry and every. single. second. you spend inching closer to all you're meant to be. 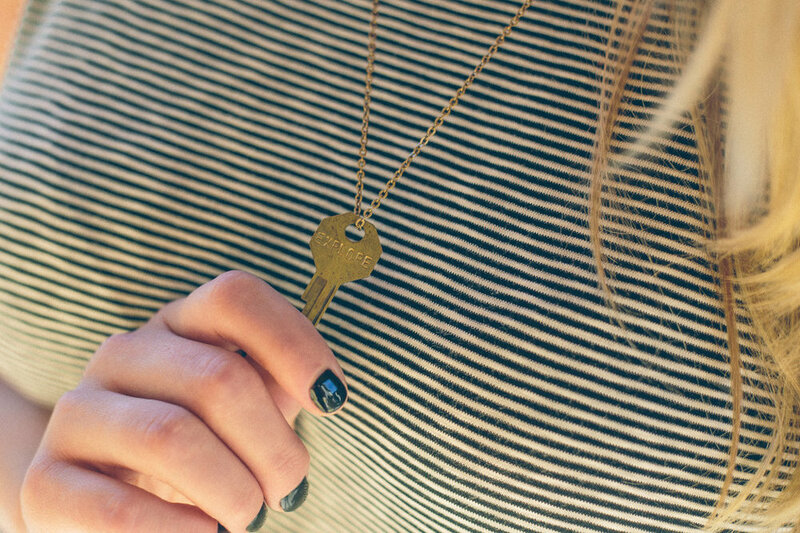 To continue celebrating the launch of the new website, I am giving away a necklace from The Giving Keys! They're one of my favorite organizations, and they're doing amazing things to help transition people out of homelessness. Go check them out!